Cook tender, fall-off-the-bone ribs and succulent roasts in a Char-Broil smoker. Char-Broil Digital Electric Smokers feature TRU-Infrared technology that infuses smoky flavor into meats, vegetables, and casseroles like mac and cheese. Choose a smoker with SmartChef technology to connect the device to the cloud and your smartphone. Put your Char-Broil electric smoker to work when you need to cook for a tailgate party or a family gathering. Make sure you have your grilling tools ready to take hot foods out of your smoker. Adjustable shelves let you smoke prime rib, chicken, and sausage at the same time. The oversized smoke box provides up to eight hours of smoke before you need to refill it. Set the smoker to cook by time or probe temperature; then you're free to spend time with your guests. 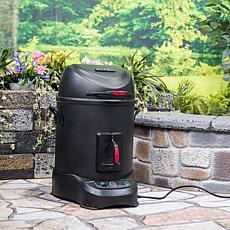 The smoker will turn off when your food is done and keep it warm until you're ready to eat. Deluxe models include remote controls and window doors for added convenience. For big crowds, add an oil-free Char-Broil fryer to your outdoor kitchen. Fryers fit turkeys up to 16 pounds. Set your patio table with outdoor tableware from HSN, too. 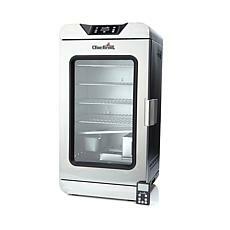 Shop Char-Broil products at HSN today.